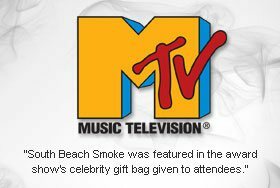 A revolutionary alternative to traditional cigarettes, the South Beach Smoke Electronic Cigarette offers an authentic cigarette experience without the smoke, tar, ash and odor, which is normally produced by tobacco cigarettes. 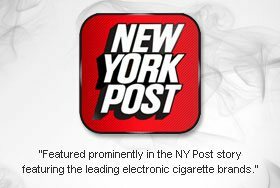 Since no smoke is produced, an electronic cigarette does not burn - that means, no matches needed. 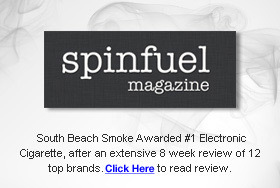 South Beach Smoke has its own exclusive liquid nicotine solution that is vaporized using a built-in heating element. This element creates vapor that feels, looks and tastes like a traditional cigarette, but smoke-free, tar-free, carbon-monoxide free and odor free. All South Beach Smoke Deluxe batteries have a crystal orange LED light that lights up with each puff. 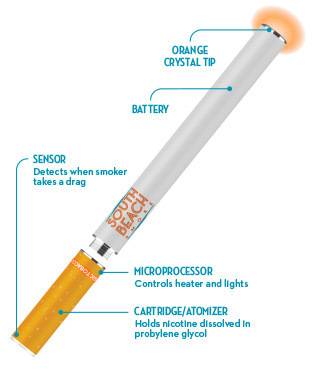 The orange LED light also signals when it is time to recharge your electric cigarette. 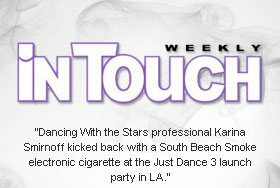 The South Beach Smoke Deluxe Series Electronic Cigarette Battery is built using advanced Lithium-Ion battery technology. This proprietary battery has been engineered to provide maximum vapor, longer battery life and superior performance. Available in black or "cigarette-paper" white and in Standard & High Capacity. The South Beach Smoke Deluxe Series Electronic Cigarette's are built using a 2-part technology to ensure the industry's best smoking experience. The atomizer is built right into the cartridge, guaranteeing maximum vapor and superior taste with each puff. The South Beach Smoke Electronic Cigarette Flavor Cartridges have 10 flavors to choose from and are built with the patented VaporFlo™ technology. VaporFlo™ technology is designed to provide a smooth, yet flavorful draw while producing maximum vapor..
South Beach Smoke's one-of-a-kind silicone tip was built into the mouth piece to prevent leakage that the electronic cigarette's cartridge may produce. The single-hole design provides maximized draw and resistance... just like a traditional cigarette.